This is my photo, not taken from Wikipedia, I uploaded it a few years ago. Today's update will be one of the shorter retro-reviews. During my first visit to Taiwan in February of 2007, I tried not only corn soup for the first time, but also a shrimp burger for the first time. 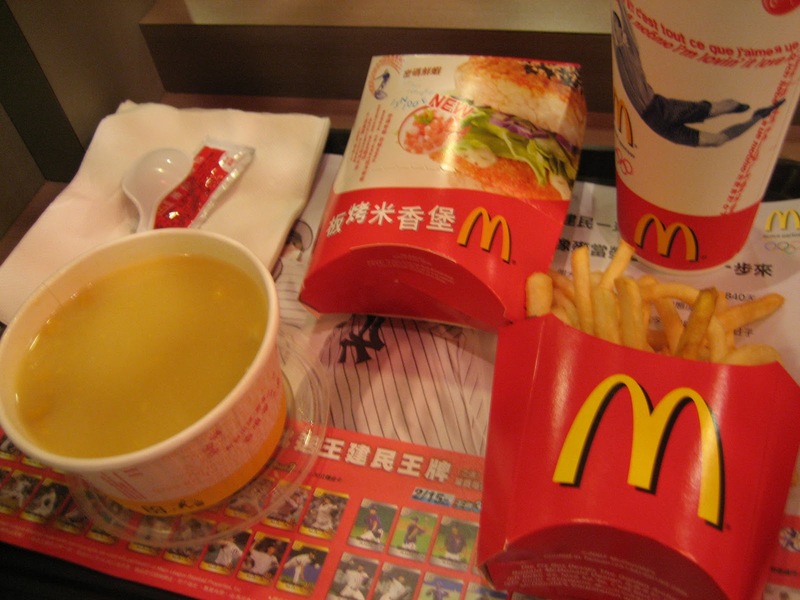 One of the things that always stood out for me in Taiwanese McDonald's was that you were able to substitute your fries or drink for a corn soup. Though very salty, I found it to be a tasty and unique alternative to the fatty fries. On subsequent visits to Taiwan I would add copious amounts of black pepper to the soup and I enjoyed it even more than I did this first time. 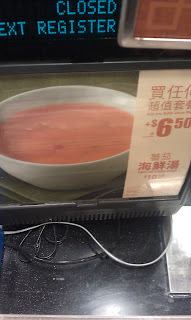 I was told by a Taiwanese friend that the locals will only order the soup when they buy chicken, and often put pieces of chicken meat into the soup. I have since tried a shrimp burger in other McDonald's around Asia (Japan and Korea), but this was the only time I have had it with a rice bun. I assume this is in competition with the Japanese franchise Mos Burger, which serves many of its burgers with a rice bun. I remember there being large pieces of shrimp inside the breading, rather than a shrimp-mince which is how the shrimp burgers are served throughout the rest of Asia. When I checked the McDonald's Taiwan homepage before writing this post, I was disappointed to find that the shrimp burger (and all the other rice burger variants) had been removed from the menu entirely, and has been brought back with a standard bread bun for a limited time only. Also more disappointing, is that since it was so long ago, I have no idea which branch I ate at, nor how much it cost. I found a Flickr photo that someone took of the Taiwanese menu back in 2003, so even though it was long before I tried it, it still gives me a rough idea on how much it was. I haven't had McDonald's in Taiwan since 2009, but I will return in February of 2012 and expect a full review of all their items then. As a side note. During a trip to Hong Kong earlier this summer I made another McDonald's soup sighting!